Is it play time yet? Spoil your dog with one of our luxury dog toys. We have toys for the girls including the Sniffany Box and Bone and the Stella MuttCartney Shoes and we have toys for the boys too including the Bark Street Journal, IBone and IPaw'd (the famous Apple iPhone and iPad but in a squeaky form!) For the more sophisticated dogs, we have some luxury organic ticking linen squeaky dog bones that are all handmade to order for us by Mutts and Hounds here in Britain! Go on, give the dog a bone! Our great range of luxury dogs toys are guaranteed to keep your dog happy. From squeaky bones to tough deer antlers, we have everything you need to fill your dog’s toy basket with lots of fun and exciting gifts. Tech savvy dogs should check out our iBone and iPaw’d (the chewable, squeaky version of Apple’s iPhone and iPad!). 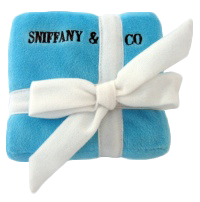 Little princesses should have a Sniffany & Co Box or Bone or an Alexander MuttQueen Pink Shoe. At Chelsea Dogs, we also have a range of organic dog toys including a Lion Ring, a Hippo Ring and an Adam Dog, all of which are also hypoallergenic making them ideal for puppies.